Radiating out from the roundabout in front of the lodge we have restored old sugar pine cabins into the June Bug youth hostel dormitories over twenty years ago and have added new stilted hillside cabins with private rooms, family cabins, tent cabins and vacation homes. 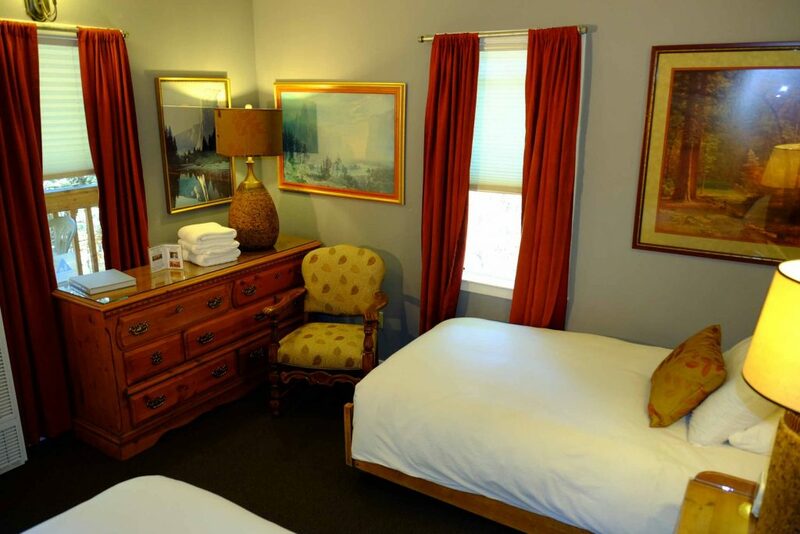 In different rooms you will discover different old, refinished and new furnishings and decor each time you visit. We are having a great time with these rooms and sure hope you do as well. Vacation rentals do not have housekeeping services as the rest do and, of course, all accommodations have linens. 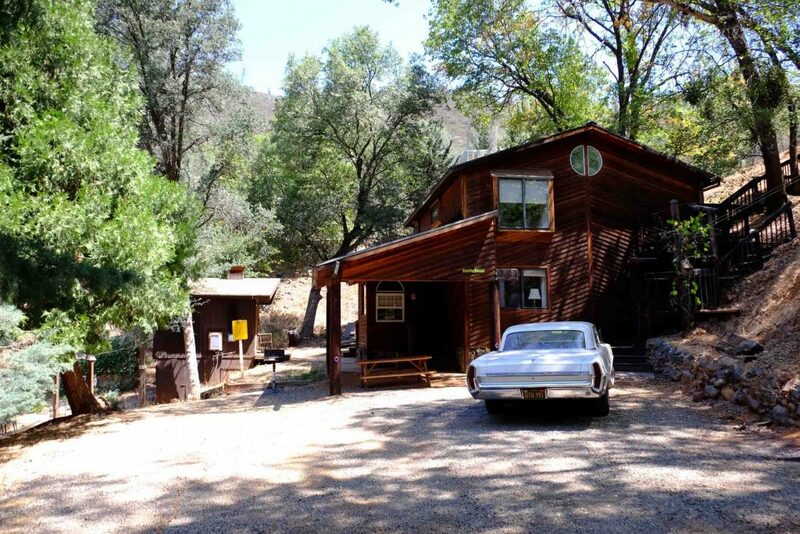 Parking can be hundreds of feet from your cabin on this hillside property. You will find accessible rooms online with van accessible parking, but with all rooms, on this hillside there are three levels of parking areas that may not be on the same level of the van accessible parking at the spa, reception, restaurant and meeting room. The spa, reception and restaurant are all ramp access. The best rooms with love and character, these rooms come in a variety of bed types for couples to families. 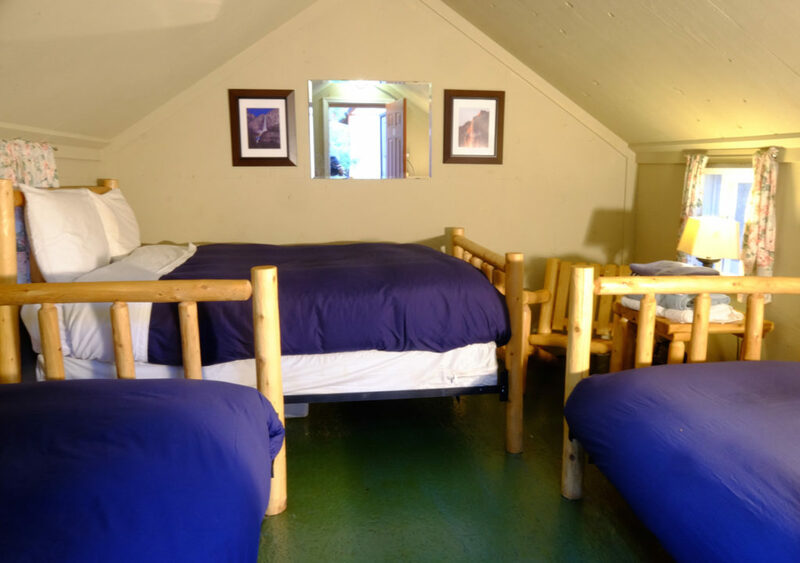 These duplex cabins at 300 sf each all have forest views and decks with tables and chairs. Not so rustic with fine linens, fine bath products, towels, showers, heat, coolers and wi-fi. The rustic reflects in the lack of TV’s or phones and remote parking. An accessible room with two queens at 360 sf and and roll in shower accessible restroom are near a van accessible with ramp to room. This is not the accessible same hillside level of the Main Lodge amenities. Family cabins are duplexes with three doors on the deck. 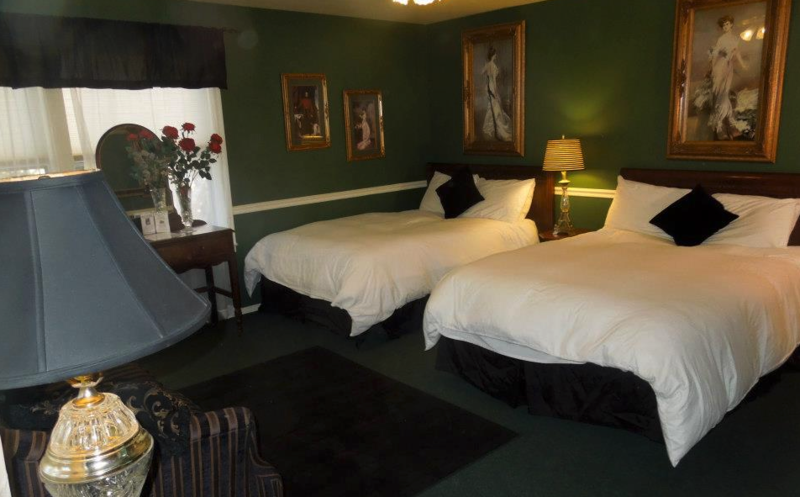 Two private rooms and one bath that are usually sold separately. A bit smaller and than the private rooms at 190 sf, but with high ceilings. One room is always a queen and a bunk with two twins at 210 sf, and the other side is a queen or two twins beds. Still very nice these rooms have amenities and decks as well. Two accessible rooms, one with a full size bed at 218 sf and the other with a queen and a bunk at 228sf share a roll in shower with accessible ramp to a van accessible parking spot. This is not the accessible same hillside level of the Main Lodge amenities. Imagine a rough wood frame with a rubberized cotton canvas shell on it and you have a historic Yosemite style tent cabin. They have electricity for lighting and fans, screen doors, linens, decks and log furniture or antiques. The glamping style heated insulated tent cabins have additional interior walls, heaters and decks. The new tiled restroom complex has a sink bank, a laundromat, private showers and toilets. Some tent cabins are closer than others to bathrooms. These old cabins look new inside and out but have been here for about 80 years. 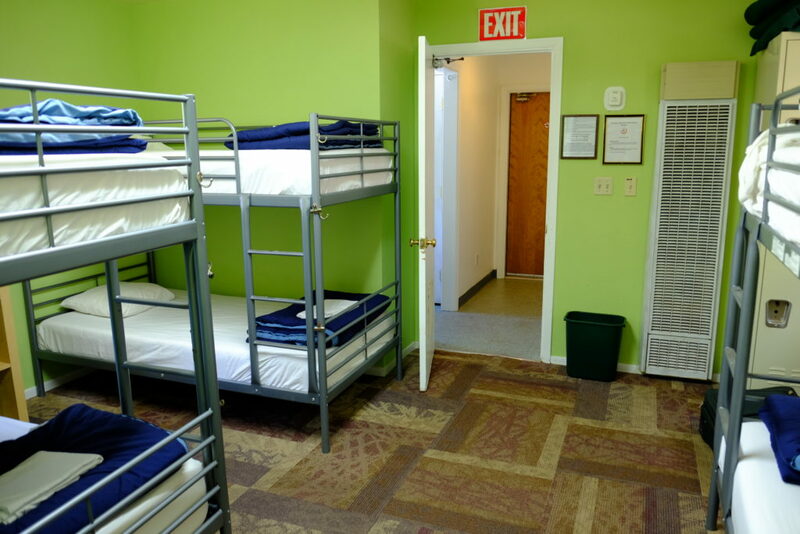 New white steel beds, lockers, shower amenities and linens are included. Very nice and very clean, these are usually two rooms sharing a two baths, two showers and a sink bank at 645 sf. Backpackers still set the tone at the Bug and we have a guest kitchen for those who bring some food of their own. Decks outside with tables and chairs, too. An accessible room three bunk and two accessible lower beds at 300 sf with a roll in shower accessible restroom are near a van accessible parking with a ramp. This is not the accessible same hillside level of the Main Lodge amenities. On adjacent property, but just across the stream is the fun hippie Starlite House. The handmade cedar and stone house has two bedrooms and two baths, full kitchen, dining/living area and a daybed just off the first bedroom. It can accommodate seven people, and like most vacation rentals has no daily housekeeping service. Our beautiful vegetable garden is there as well. Just inside the entrance at Starlite is the Barn House with the Studio on the second floor. Great country hippie style interior with a kitchen living dining area, a small bunk nook and a queen bedroom with a small bath. There is a deck at the door in the back with tables and chairs. The same price as a private room at the Bug but larger and with a kitchen. Parking is free, however on this hillside property the three lots will be away from your room. We recycle and compost. We conserve water and energy. We strive for sustainable and regional foods. Out grains are mostly organic. We grow vegetables for the cafe every summer. There’s a shop at reception for gifts, hygiene products and travel items. We have a guest kitchen. The spa offers day passes for the hot tub, shows and hot rock sauna. Massage therapy, specialty baths and yoga are available. Our Cancellation Policy is 5 days for all accommodation except male, female and coed hostel dormitories at 2 days. We do not precharge regular reservations. Much better and flexible than exceptionally high cancellation policies and precharging as most Yosemite area hotels have. Heaters and evaporative coolers on all accommodation except tent cabins. All facilities have been renovated, with signature recycled, new furniture, and soft goods. Housekeeping services for all accommodation. Yosemite information and itinerary help at the Front Office. Look at our news as well. Bug property trails and seasonal swimming hole nearby. Board games, ping pong, darts, guitars, horseshoes, and foosball. Amtrak and Yosemite Area Regional Transit shuttle bus stop. 15 % off everything if you arrive in public transit or bicycle.